Wednesday was Day 2 of the Nizhny Novgorod Governor’s Cup, and four of the six competing teams were in action. The one consistent theme s far has been the lack of consistency, with Tuesday's victors struggling and Tuesday's vanquished recovering. Metallurg Novokuznetsk vs. Avtomobilist Yekaterinburg: 1-3 (0-0, 0-2, 1-1). A story of triumph over adversity by Avtomobilist, who made up for yesterday's defeat by Ak Bars by claiming a hard-fought victory over Metallurg Novokuznetsk. The Yekaterinburg team had to start without one of yesterday's goal scorers, Francis Pare, due to a mystery illness and lost Taylor Beck in the first period through injury. This was due to a foul by Metallurg's Ivan Gulyayev, for which the latter received a game misconduct for kneeing. That “quite a while” was the first 36 minutes of the game, until Alexander Torchenyuk put the Motor Men in front. The wait for the second goal was far shorter - a mere 2 minutes 18 seconds, to be precise, had elapsed until Artyom Gareyev doubled the lead. Novokuznetsk hit back with a goal by Juraj Majdan a little over 6 minutes from the end, but the win was sealed when Evgeny Chesalin, who assisted on Torchenyuk's opener, converted a penalty shot with 19 seconds remaining. Torpedo (Nizhny Novgorod vs. Ak Bars Kazan: 3-1 (21, 1-0, 0-0). 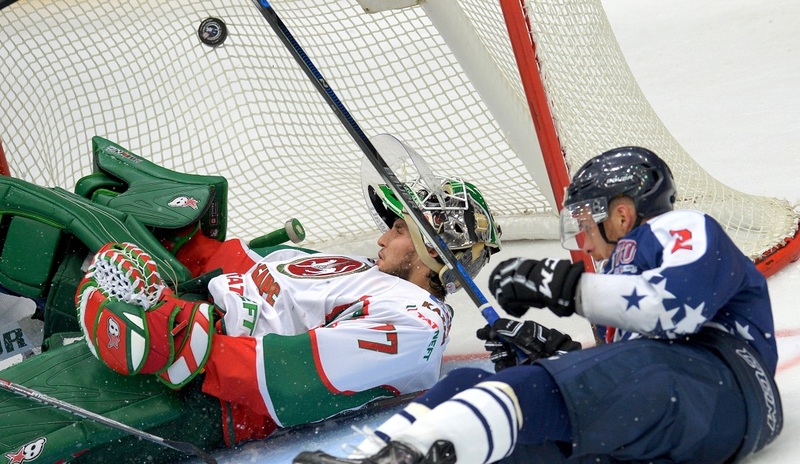 The hosts enjoyed a much better Day 2 than Day 1, when they were kept off the scoreboard by Salavat Yulaev. The match was preceded by a tribute to former Torpedo legend and 1984 Olympic Gold medalist Vladimir Kovin, who was presented with various honors recognizing his contributions to club and country, and the team grabbed its first goal of the season after just two minutes, whenKaspars Daugavins scored on the game's first powerplay. The match was a feisty affair littered with penalties, and as a result, it was the powerplay units which decided the outcome. Ziga Jeglic made it 2-0, again with the man advantage, while the men from Kazan needed three spells of numerical superiority before Alexander Svitov notched his second goal in successive days on the 12-minute mark. The contest remained a tight one until Danil Veryayev made it 3-1 late in the second period. That was the end of the goals, but not the end of the action. The third period saw tempers frayed, conflicts erupting, helmets flying, and yesterday's game-winner Justin Azevedo even earning a misconduct penalty. At least no-one could complain that preseason games are timid affairs. Amur had the better of the opening stages and Alexei Byvaltsev put them ahead in the 11th minute, but Daniil Apalkov leveled the score half-a-minute before the second interval and Artur Kayumov gave the hosts a 2-1 lead half-a-minute after the teams returned to the ice. Nikita Cherepanov sealed the win with Lokomotiv's third. 2:1! Артур Каюмов выводит нашу команду вперёд на первой минуте третьего периода! Defenses were on top in Wednesday's encounter between Novosibirsk and Helsinki. Sami Lepisto scored the only goal of the game in the 29th minute. Milos Riha saw his men suffer their third preseason defeat at the hands of his fellow Czechs, after back-to-back defeats at Dynamo Pardubice, but this reversal might have hurt a little more as it took place in Bratislava. Slovan's goals were scored by Buchtele, Liska, Repik and Kaspar.